In the process of creating her 2015 Graphic design Thesis exhibition concerning the divergence of perspective between graphic designers and fine artists, Laura Miller asked me to be apart of her study as a featured contemporary graphic designer. 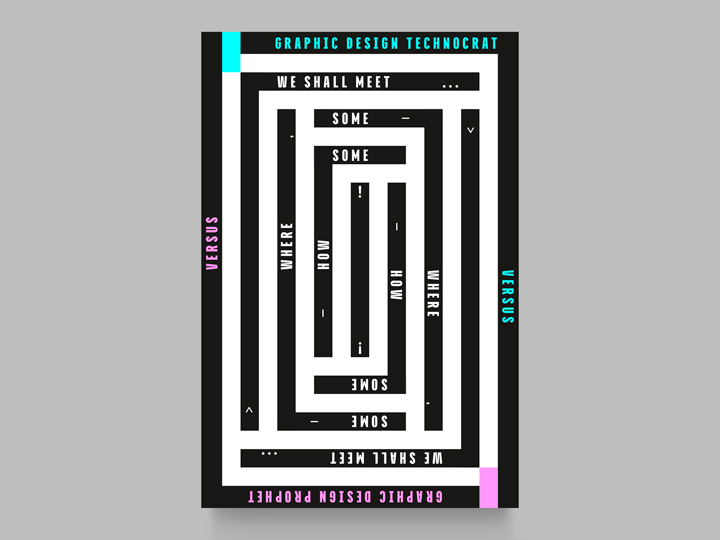 The Thesis analyzes the disconnection between Graphic design Technocrat (the Graphic designer) and Graphic design Prophet (the Artist), explores the collaboration of these two subjects and draws a fine line between the two creative means of communication. I designed a poster for Laura — called ‘We Shall Meet.. Somewhere, Somehow!’ — where I tried to represent the drastic division between the Technocrat (the Graphic designer) and the Prophet (the Artist) in a very ‘optimistic’ way: the ‘playing field of communication’ is here represented as the same for both the figures and it is interpreted as a perfectly symmetric labyrinth in which the two are entering. The Technocrat is represented with a fizzy fluo-blue color, the Prophet with a more calm fluo-pink one. 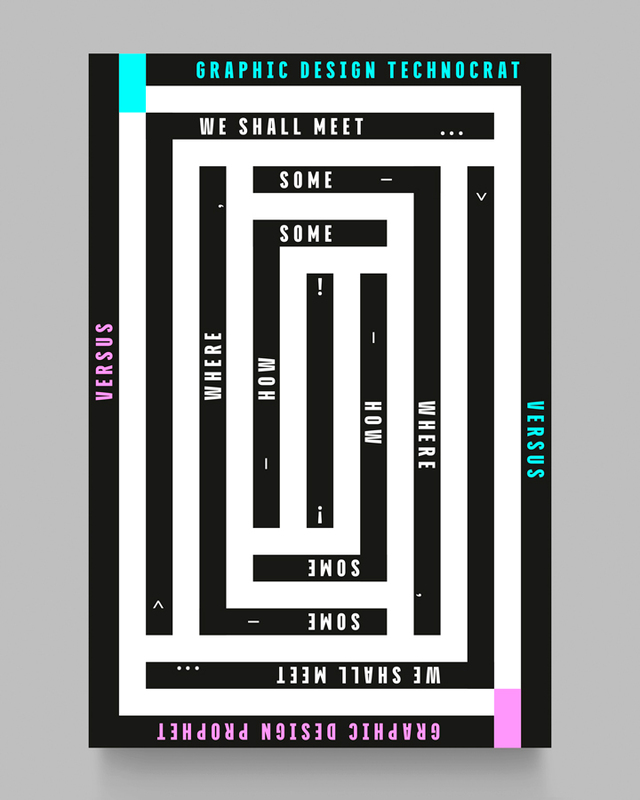 Many are the options of directions for the two to take there, in the labyrinth: they could meet between themselves immediately, or the meeting could be very complicated. Everything is full of variables: external factors to their creativity, or just differences in style, or some mere coordination problems. It is just a matter of research and perseverance… Could these two figures ever meet here, inside of this labyrinth? It is my hope that they will. Somewhere. Somehow. But they can, and they will. 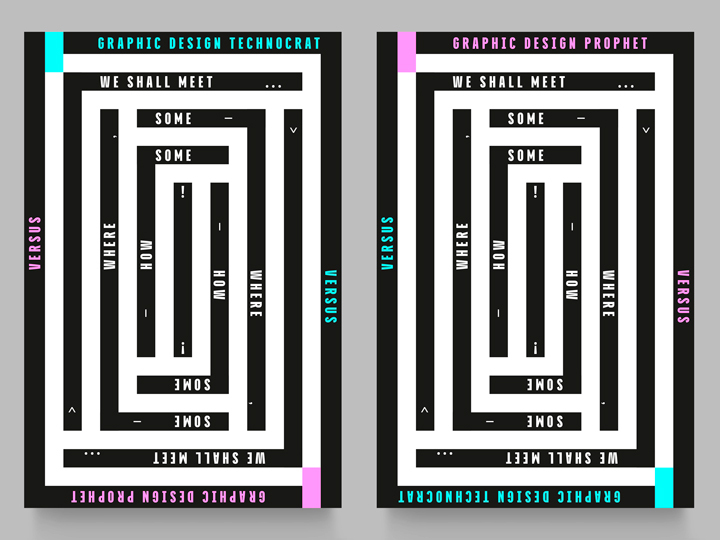 The poster is perfectly symmetric, in the way that if you flip it vertically it remains the same, by changing just the position and the color of the graphic ornaments (texts).